Farmers have sown only a little over 4.5 lakh hectares till the end of November 12 — far less than 8.5 lakh hectares recorded during the same period in 2017-18 rabi season. Sowing of rabi crop in Gujarat has drastically dropped by 47 per cent as compared to last year. According to data from the state’s Agriculture, Farmers Welfare and Cooperation Department, farmers have sown only a little over 4.5 lakh hectares till the end of November 12 — far less than 8.5 lakh hectares recorded during the same period in 2017-18 rabi season. The drop, farmers and government officials say, has been because of poor monsoon this year and shortage of water supply for irrigation in the Narmada canal network that covers roughly one-third area of the state’s irrigated land. K S Ajitsinh, a wheat farmer at Nani Vavdi village in Botad district, may not sow rabi crop this year. The only irrigation well in the 40 bighas of land that his family owns has run dry and the network of Narmada canals that zigzag in and around his village are bone dry. “The government has promised to provide Narmada water from November 12 for the rabi crop. Today is November 14, and still there is no water in the canal. The only well in my farm is dry, and if water in the canal is not provided, then I will have to drop my plans to sow wheat and gram,” he said. With most of the rabi crops being sown by mid-November, the chances of any significant rise in the rabi acreage this season is very unlikely. Rabi sowing has been worst hit in Kutch district, where all its 10 talukas have been declared as “scarcity-hit” by the government due to deficient rainfall — till August, the district had recorded a deficient rainfall of 57 per cent. Till November 12, just 700 hectares have been sown with rabi crops, which is 93 per cent less compared to the same period last year. Fodder has been sown in a significantly large area of 300 hectares in the district, which is already witnessing migration of cattle-owning communities. The districts of north Gujarat, central Gujarat and Saurashtra have also witnessed a decline of 55 per cent, 75 per cent and 70 per cent, respectively, in rabi crop sowing. Similar trend has been seen in all the six districts where a number of talukas have received less than 250 mm rainfall and have been declared as “scarcity-hit” by the government. For instance, in Patan, sowing of rabi crops has been done in over 15,100 hectares, which is 84 per cent less than last year. Here the rainfall deficiency this monsoon was a staggering 61 per cent till August. Similarly, in Surendranagar, with 40 per cent deficient rainfall, rabi sowing has dropped by 75 per cent, in Mehsana (with 53% deficient rainfall), sowing has dropped by 61 per cent. 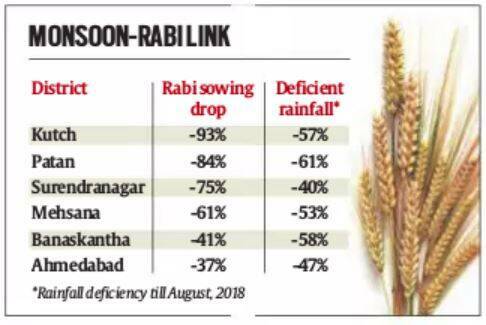 Banaskantha in north with just 42 per cent monsoon has registered a drop of 41 per cent in rabi sowing, and Ahmedabad has witnessed 37 per cent decline. “Rabi crop sowing has been very slow this year. Only those farmers who have access to irrigation are going for it. Farmers in Saurashtra who used to irrigate using water from their wells are not sowing this time as their wells did not recharge due to paucity of rains during the monsoon. However, if water from Narmada is provided, then more farmers will go for sowing a second crop this year,” said Sagar Rabari, founder and head of Gujarat Khedut Ekta Manch, a newly formed body of farmers.. However, south Gujarat districts that received normal or surplus rainfall this monsoon have registered a 72 per cent jump in sowing of rabi crops. Farmers, particularly in Bharuch, Surat, Navsari and Dangs districts, are sowing more sugarcane, a water-intensive crop. If individual crops are taken into consideration this rabi season, crops that have seen their acreage increase are sugarcane and jowar. Of the total 15,600 hectares of jowar planted in Gujarat this season, a sizeable 11,600 hectares of the crop has been planted in Porbandar district alone. However, in other part, concern about the paucity of water for irrigation is definitely high on the minds of farmers. For instance, if the area of irrigated wheat is taken into the consideration, farmers across the state have so far sown only in 9,900 hectares, a drop of 87 per cent as compared to last rabi season. Earlier this year, the government had to release over 20,000 cusecs of Narmada water to save the standing kharif crops from wilting in wake of a deficient monsoon. The trend is likely to continue for rabi season. Deputy Chief Minister Nitin Patel had recently announced that farmers will be provided Narmada water for irrigating their rabi crops from November 12, 2018 to February 28, 2019.